Senior Ricardo Corona gives senior Valerie Sosa a friend gift. How are you going to make your special Valentine happy? 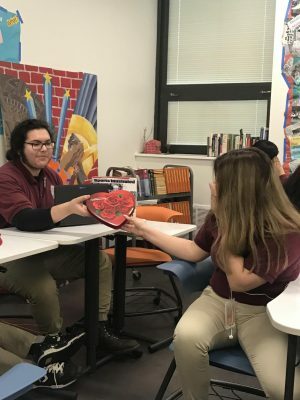 Most of Morton East students will celebrate Valentine’s day with a loved one — be it girlfriend/boyfriend, just friend or family. Valentine’s Day is every year on February 14; people exchange cards, candy or flowers or a special dinner with their special someone. Valentine’s Day is popular in the United States as well as in Britain, Canada, and Australia, and it is also celebrated in other countries, including Argentina, France, Mexico, and South Korea. Some people take their loved ones for a romantic dinner at a restaurant while others may choose this day to chill at home with family members or friends. In a random survey of 180 Morton East students, 85 reported they do celebrate Valentine’s Day with their loved ones. “My partner and I don’t really want to waste a lot of money, so we just go out and eat at our favorite restaurant which is Chick-fil-a,” junior Israel Martinez said. Although a lot of people like to celebrate Valentine’s Day with their loved ones, not everyone does that. “I think Valentine’s Day isn’t only for couples; it can also be family and friends. I’m not planning on doing anything special on valentine’s day. I’ll probably just spend it with my mom and buy her flowers, “sophomore Daisy Patillo said. There are those people who expect to be taken someplace special, and possibly receive gifts. “I would like to receive chocolates, candy, flowers, and a bear. Also, I would like to go eat at Father and son’s — it’s a pizza place,” senior Marisol Roman said.